Detroit has a dangerous lineup and made some smart off-season additions in Justin Upton and Jordan Zimmermann, but will the Tigers' age and fragility catch up to them? This week, SI.com is previewing all 30 MLB teams for the 2016 season, counting down to the No. 1 team in the league. At No. 18: the Detroit Tigers. The Tigers won the AL Central every year from 2011 to '14, and it’s not difficult to see how they could return to the playoffs this year after an off-season in which they filled the three biggest holes on their roster with star-quality players in ace Jordan Zimmermann, slugger Justin Upton and closer Francisco Rodriguez, all without sacrificing a player from their 40-man roster. If Justin Verlander can build off his strong finish to 2015 (2.27 ERA over his final 14 starts), he, Zimmermann and a healthy Anibal Sanchez could be a formidable trio backed up by the league-average ground-balling of winter addition Mike Pelfrey and the high ceiling of 23-year-old lefty Daniel Norris. Rodriguez and fellow new arrivals Mark Lowe and lefty Justin Wilson give the Tigers a quality top three in the bullpen, as well, with a slimmed-down and rededicated Bruce Rondon as another potentially dominant short reliever. The yawning gap between the quality of the name on the jersey and the performance of the player within swallows this team whole. Victor Martinez is a 37-year-old with bad knees who posted an 85 OPS+ last year. Kinsler turns 34 in June. 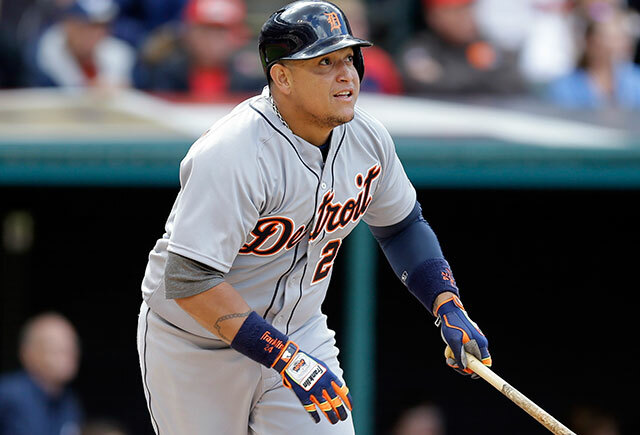 Cabrera will be 33 in April and has proven increasingly fragile in recent seasons. Upton’s contact and strikeout rates have been trending in the wrong direction in recent seasons, and he represents a significant defensive downgrade from Yoenis Cespedes, who won a Gold Glove for four moths of work in Detroit last year. Worse, the young players in the lineup (Castellanos, et al.) all appear to have limited ceilings. Not just advanced age—though that’s certainly a concern with the team’s biggest stars—but also excessive youth. The Tigers have very few players in their natural peak seasons. A third of the lineup is 33 or older, and another third of their lineup is still adjusting to the majors, with McCann and Gose in just their second full major league seasons and Castellanos a mere 24 years old. Of the top three men in the rotation and bullpen, Verlander, Sanchez, Rodriguez and Lowe are 32 or older, and the two starters appear even older due to injury and decline. Rounding out the rotation, Pelfrey is also 32; Norris is the youngest player on the team at 23. That’s how many blown quality starts—a start in which a pitcher finishes the sixth inning or beyond with a quality start but remains in the game to give up a fourth run—the Tigers have had in Brad Ausmus’s two seasons as manager, according to Baseball Prospectus, and they led the league both years, with nine in 2014 and ten last season. A blown quality start is a measure of a manager’s failure to capitalize on a winning situation—either his failing to (or perhaps in Ausmus’s case, reluctance to) call in fresh arms out of the bullpen when his pitcher is tiring, or his inability to detect a decline in his starter’s performance.